Radiator Blog: The shape of crime and escape. I went to another BLDGBLOG / Studio-X event: "Breaking Out Breaking In." This time, it was a panel with FBI agents, crime experts, and architects, all focusing on heists: what does it mean to break into a bank and how should we approach bank design? As I sat there, I pondered a much, much, much more important question: how does it affect the ways we design video games and levels about heists. How should we abstract the heist? The implication is that a bank is for robbing. It's about demonstrating a profound understanding of a design, most often in the form of breaking that design. Geoff Manaugh argued the best way of breaking a design was to engineer a counter-design. This is a mindset that game designers and players understand implicitly: a puzzle (or a test chamber) is for solving. It's like Chekhov's powerup. If it's there, it better be reachable! The story of the 2003 Antwerp diamond heist, then, reads like the one of the most ambitious game design documents ever conceived. A crazy, outlandish wedding cake of security measures: seismic sensors, light sensors, magnetic sensors, a foot-long key, and more... all foiled by a piece of wire, some tape, some hair spray, and knowing the foot-long key was kept in a utility closet, like something out of what could be the most frustratingly arbitrary (or robust?) adventure game ever made. 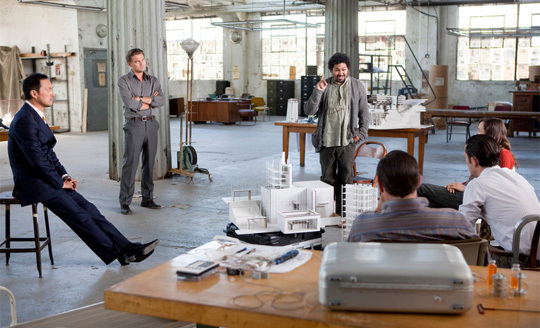 Heist films like Inception exemplify the heist as an act of counter-architecture. 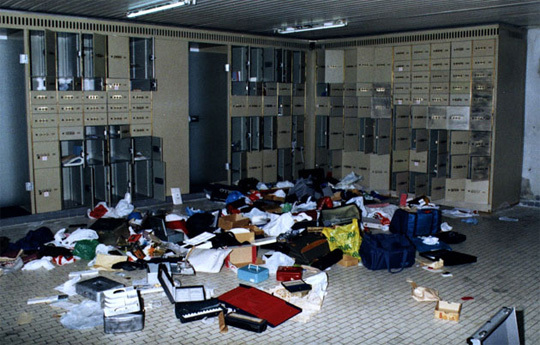 The thieves build reproductions of the vault and study scale models of the complex, all in a gigantic dilapidated-but-not-really "urban" warehouse with sparse utilitarian (but tasteful!) furnishings. This is the staging area, the hideout, the temporary architecture that exists only to subvert another architecture. It's also, almost exclusively, a cinematic fantasy. Most real-life robberies have depressingly little thought or planning to them. Every 45 minutes, the FBI agent claimed, a bank in the United States gets robbed. New York City robberies involve getaways on foot, while Los Angeles robberies involve "stop and robs" where robbers pop into the lobby then jump back onto the highway. There's not much scheming involved... you take a gun, you wear a mask, and you walk into a lobby. Introversion ran into this problem with their attempted emergent heist-sim game Subversion: every "emergent" solution boiled down to shooting guards in the face and brute-forcing your way through the vault door. They realized that the vault, in order to function as a vault, must be isolated from every other system -- that if you added a bunch of alternate passages into the vault, then it would suddenly cease to be a vault. 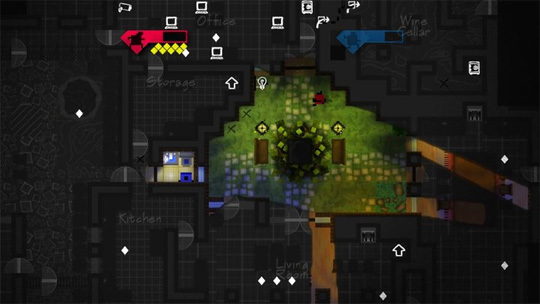 In contrast, emergence requires interconnected systems that listen to each other, while a vault neither hears nor speaks except to one. Then you have guards, who are the most interconnected piece of a security system, but they're also the weakest link because you can just kill them. Beginning Thief players often focus on incapacitating guard NPCs because that's simply what makes sense. Subversion, then, seemed to indicate the opposite of its designers' intent. Instead of fostering an appreciation of complex systems, you pitied these intricately engineered things as inherently fallible. The opposite of Subversion would be a game like Payday: The Heist, which accepts and embraces the fallibility of security instead of feeling ambivalent and awkward about it. 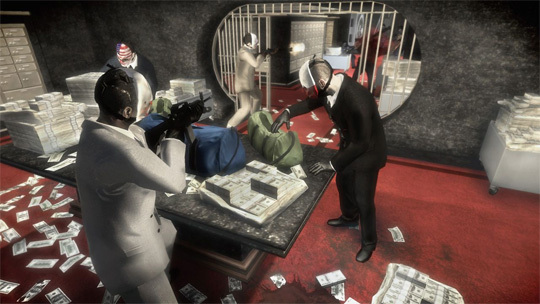 Payday is a 4 player cooperative shooter where you rob a bank by defending your position from countless hordes of cops. 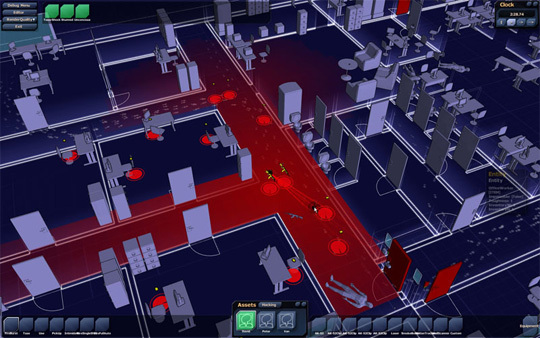 It draws frequent comparisons to Left 4 Dead -- except from the videos, it looks like every gameplay beat consists of a crescendo event where you defend a point as a timer ticks down. While Left 4 Dead benefits from a constant push for movement and escape, Payday is about always standing your ground, which unfortunately sounds repetitive, even if enemy movements and pacing is randomized. If you watch the video above, the reviewer says it's "realistic" like 100 times, though I'd argue realism isn't the goal so much as reskinning a "defend the capture point" structure so that it's relatively unrecognizable, thus requiring smaller non-linear levels with higher fidelity. It's a smart production choice, but I'm not sure if it was a smart design choice... I won't dwell on this point, though. The point is that this is a game that embraces the heist as a chaotic slaughter, and bank security as a mere inconvenience. Security fails within the first few seconds of every match. Something like Andy Schatz's Monaco might represent the sweet spot between reverence and disregard: it has somewhat complex security systems / patrol paths like in Subversion, but with the fast-paced arcade-sensibilities of Payday. Today's banks are simply designed to be slightly more inconvenient to rob than the competing bank down the street. Sure, you can put up bandit barriers, motion detectors, and work out efficient camera placement, but that won't mean a thing if the thieves wear police officer uniforms or if a bribed guard turns off the security system or if the robbers have a small arsenal. Let's get rid of the vault, then. Let's ignore the bank and think about a different architecture / system of value: the art industry. 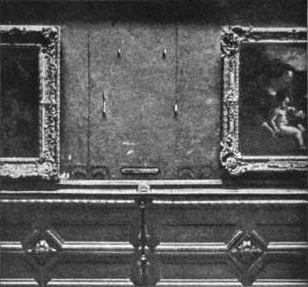 In 1911, someone stole the Mona Lisa from the Louvre. There weren't any laser tripwires or security cameras or anything; it was just there, hanging on some wall hooks. The newspapers declared the theft a sensation; record numbers of visitors streamed in, just to see the empty spot on the wall where the painting used to be, creating one of the first pieces of conceptual art in history. No one could figure out how it disappeared. Years later, it turned out, an employee hid in a broom closet with it, then walked out after the museum closed. The point of that story isn't that museums shouldn't trust employees -- the point is that theft seems to make art more valuable, that the threat of theft legitimizes art. The art world needs thieves to exist. This idea exposes one of the weaker aspects of Thief games: there's a lack of economy, no system of value in a game that's all about exploiting that system of value. Diamonds and Picassos are valuable only because we arbitrarily say they are. 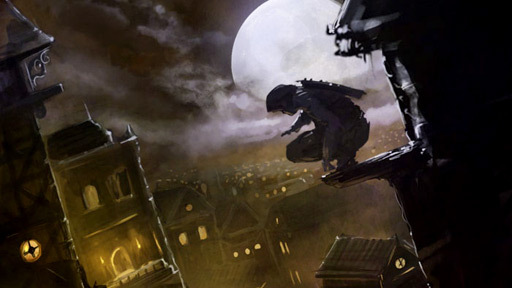 I'm not saying a Thief game should simulate a micro-economy, but it should abstract it in a meaningful way. Reiner Knizia's auction board game masterpiece, "Modern Art," does this beautifully. One quick test for meaning in any given choice in a game is to ask yourself, is there any strategy that involves doing the opposite? Barring a few scripted cases, is there ever a reason NOT to steal a piece of loot in a Thief game, or even to hesitate at all? Did you ever really have a choice in stealing? There could be a game called "Art Thief." It would involve breaking into local museums and galleries. You would have to learn artists' visual styles, gauge their relative worth, and learn enough about painting to recognize counterfeits that other art thieves try to sell to you. Sometimes you'll let a painting hang just because it's not enough of a big fish yet, but you risk the museum closing another security loophole every time you break into the galleries. Maybe you'll plant a counterfeit in that painting's place, knowing that a rival art thief will come to steal it? Maybe there'd be a way to devalue certain paintings so others will ignore it? Upon its release, Art Thief earns a Metacritic score of 79/100. Reviews praise its attempts at art education and art history mechanics, but claim that it "feels like 2 different games" and "the fire extinguisher textures are blurry" which is probably the worst design flaw ever and isn't a petty thing to complain about at all.